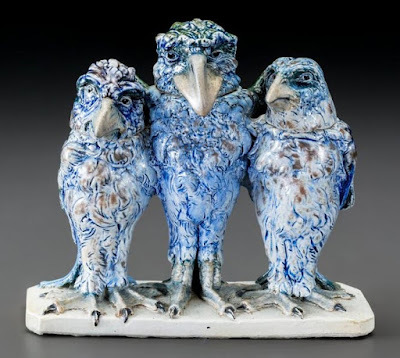 The Martin brothers: Robert, Walter, Edwin, and Charles, born to Robert Thomas Martin and Margaret Fraser, made the The Martinware Pottery (1873-1923) that is now a very hot item fetching well over its estimate. 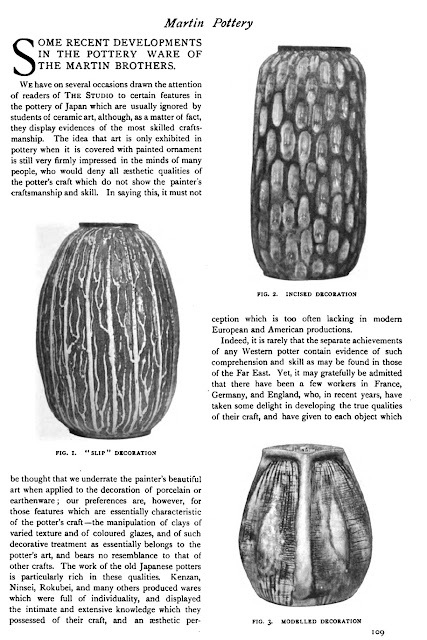 Today the same sentiment is felt for their pieces as it was in 1912: "wonderful creations [which] are now eagerly sought after by art connoisseurs in all quarters of the world." According to sources the brothers themselves lived unpretentious lives "holding aloof from all municipal and social affairs." 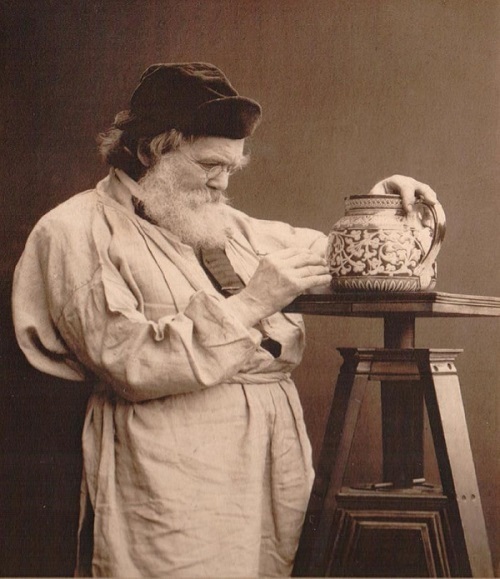 Many who noticed their humble pottery on Havelock Road ‘associated with it personalities so vivid and remarkable as Messrs Martin, and work so graceful and beautiful as Martinware." The Martin Brothers started in Fulham in 1873. 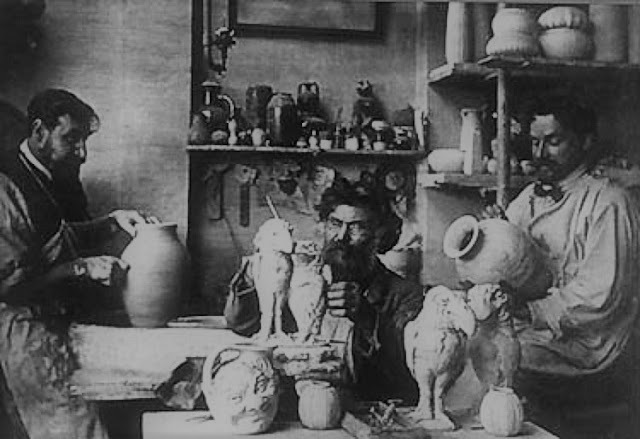 Robert Wallace, the oldest of the lot trained as a sculptor and founded the Martin Brothers Pottery. The shop and office in High Holborn was managed by Charles Douglas Martin (1846-1910) the second of the four brothers involved in the business. Between 1873-77 the pots were made in Fulham (Pomona House) and then from 1877-1914 in Southall. 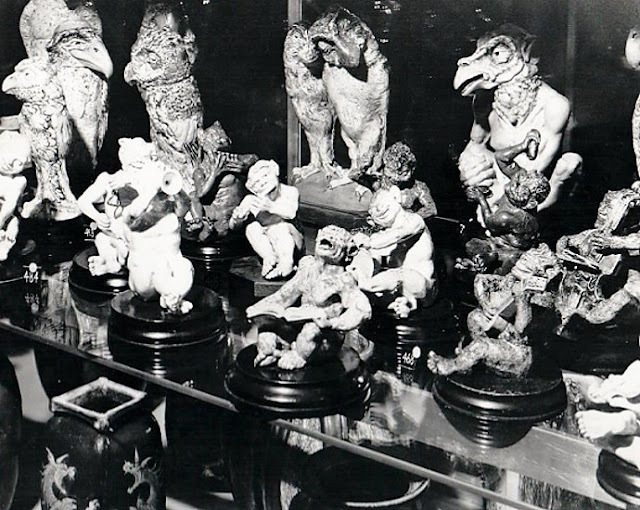 Martin Brothers' reputation rested on the production of bizarre and grotesque animal forms which the brothers began producing in the 1880s. 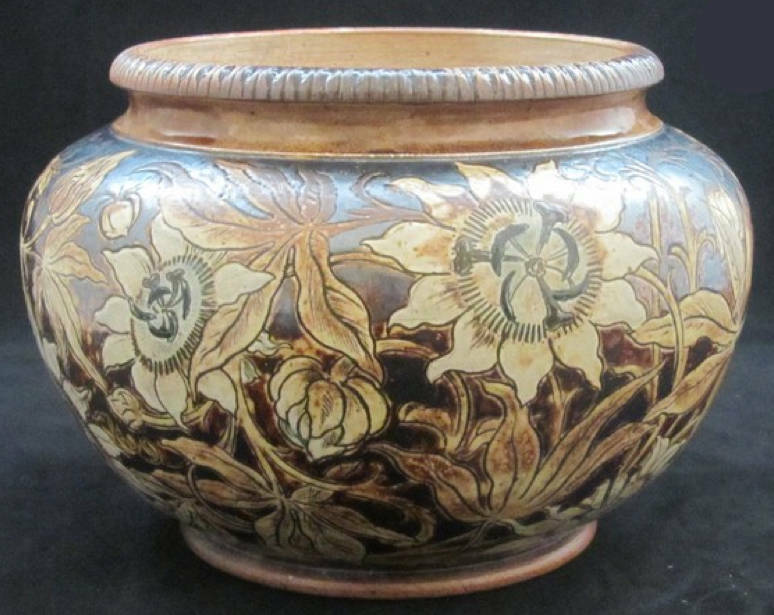 In the Census of 1911 his son, Clement Robert Martin (born c.1883) is listed as an 'Art Pottery Manufacturer'. He later went on to run the company after his father's death. 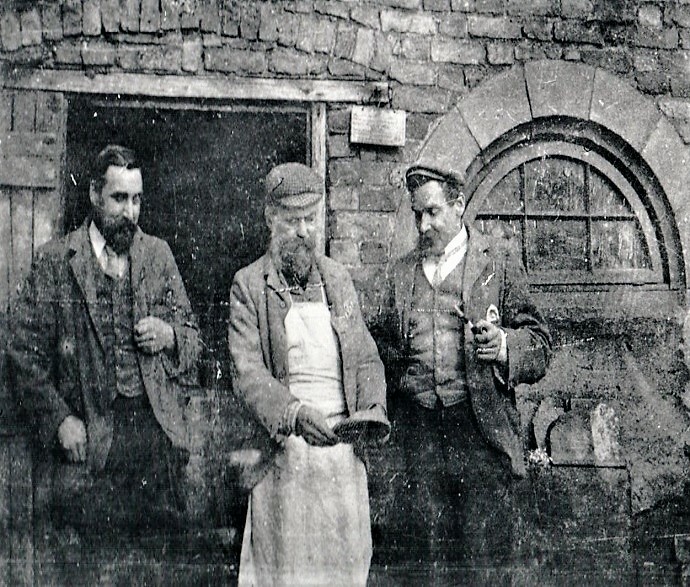 The Martin Brothers Pottery Studio, Walter at the window, Wallace to the right and Edwin in the window Photo from Ealing Library of London also the biography information. 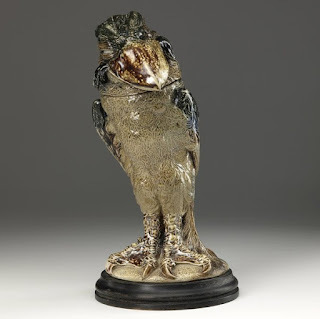 The first major show in America of the weird and astounding ceramic art of the Martin Brothers opened most appropriately last night while goblins and grotesques were abroad in the land. The Halloween preview of ''Boobies, Boojums and Snarks'' at Jordan Volpe gallery, 457 West Broadway, was in a two-room space in which the Martins' London shop with its wooden showcases is re-created and a Gothicarched stone-walled fantasy setting beyond. The latter suggests the tortured minds of these men by the use of eerie sounds, dripping water in a darkened pool, gnarled trees, live moss and mood lighting. The exhibition is of 121 arrogant-faced, bird-shaped tobacco jars, smirking spoon-warmers, sneering and leering two-faced pitchers, satyr-mask embellished jugs, a spiteful armadillo-shaped toast rack and many creepy looking vases. The show, which remains on view through Feb. 13, will travel to the Delaware Art Museum in Wilmington (March 8 through April 18) and the Everson Art Museum in Syracuse, N.Y. (May 7 through June 27). Over the next 40 years he and his brothers - Charles, Walter and Edwin - worked first in Fulham and from 1877 on remained in Southall in Middlesex where Wallace, as he was called, was the last to die in 1923. 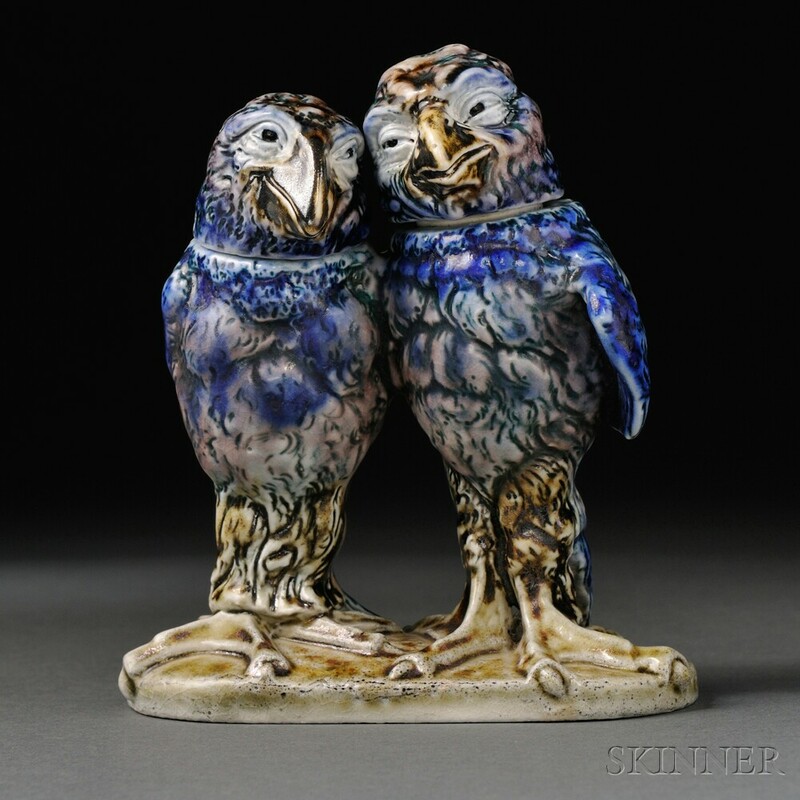 The saltglaze stoneware that they chose as their medium was remarkably suitable for devising the grotesque birds that he began to fashion in 1879, the year he did at least two owl jugs. In the 1880's he began doing his Wally-birds, tobacco jars in the shape of birds that bore little or no resemblance to any living species - save man. Indeed, some were caricatures of such prominent figures as Disraeli and Gladstone or Pickwick of Charles Dickens's ''Pickwick Papers.'' He was also extremely fond of devising hauty barristers and overbearing judges. 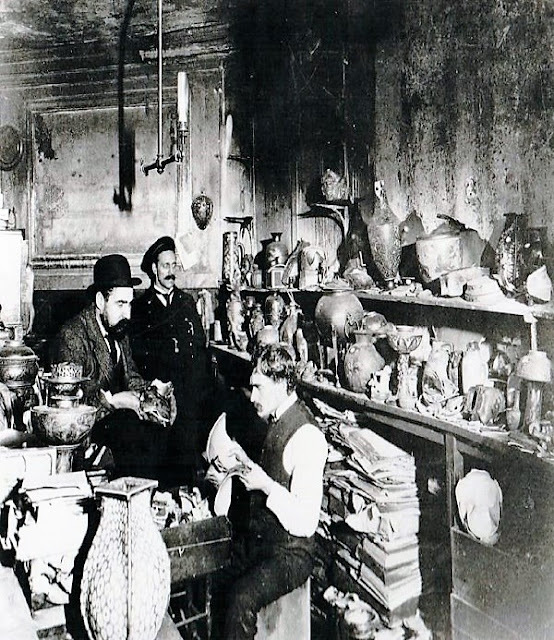 Biographers have suggested that the Martin brothers' wares reflected the tribulations that haunted their lives. Poverty dogged them throughout the years when they produced their best work - from 1880 to 1910, years when Wallace later said ''my brothers and myself never got more than a labourer's wages.'' Inadequate funds meant they were unable to buy good clay and were limited to firing their kiln twice a year, a complex and crucial process that has been described as ''excruciating events in which the Martins hobbled around damaging toes as they scrambled to cast their furniture into the kiln in an effort to keep the fire alive for the requisite 48 hours.'' Their lives were beset by their stormy relationships with one another, the death of their sister from a monkey bite, the destruction of their shop and two year's work in a fire in 1903, and tragic illnesses. Charles, who took care of the London shop, was blamed for that fire. Following it, or so the story goes, he had to be restrained from jumping through a window and within a few hours after that, his hair turned white. In 1909 he was diagnosed as insane and died a year later in an asylum. 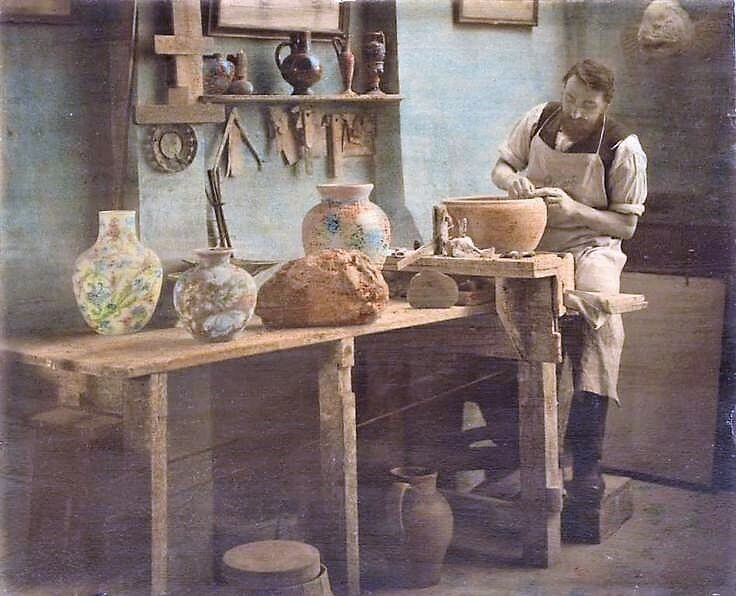 The fate of Edwin, the brother who specialized in decorating the pottery, was equally horrible. By 1911 he had begun to exhibit signs of the facial cancer which proved fatal in 1915. 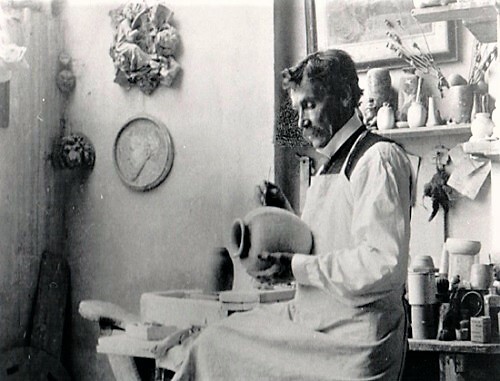 And Walter, a talented potter, who was responsible for developing the broad range of glazes that characterized their work, banged his elbow while packing the kiln in December 1911. The wound festered, a blood clot developed and the following March, a cerebral hemmorage caused his death. Wallace survived but produced very few pots after the deaths of his brothers. His work and that of the pottery was collected from the earliest period by such tastemakers of their day as Edward Burne-Jones and Dante Gabriel Rosetti. 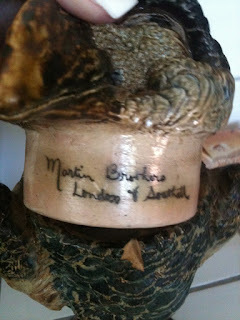 Queen Victoria also owned some Martin brothers' wares. And by order of Queen Mary, 60 pieces were exhibited at the Paris Exposition of 1914. Other works were commissioned by the Yale Club, Tiffany & Co. and American collectors. 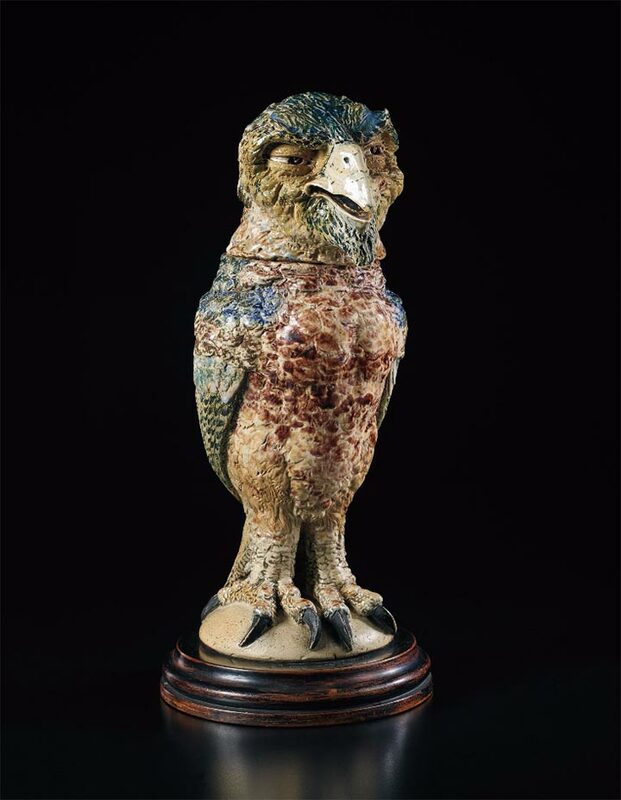 Wallace lived long enough to witness in 1921 collectors vying for Martin wares at a Sotheby's auction in London. 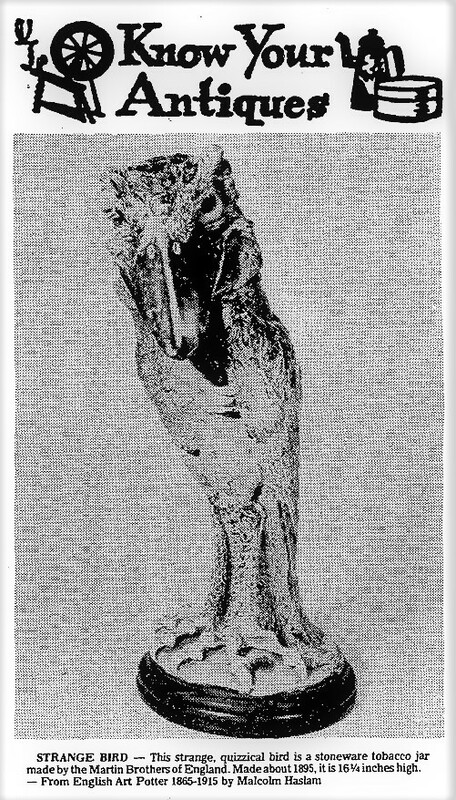 At that sale ''water welled in his eyes'' when one bird sold for 50 pounds - well above what they were when they were new. 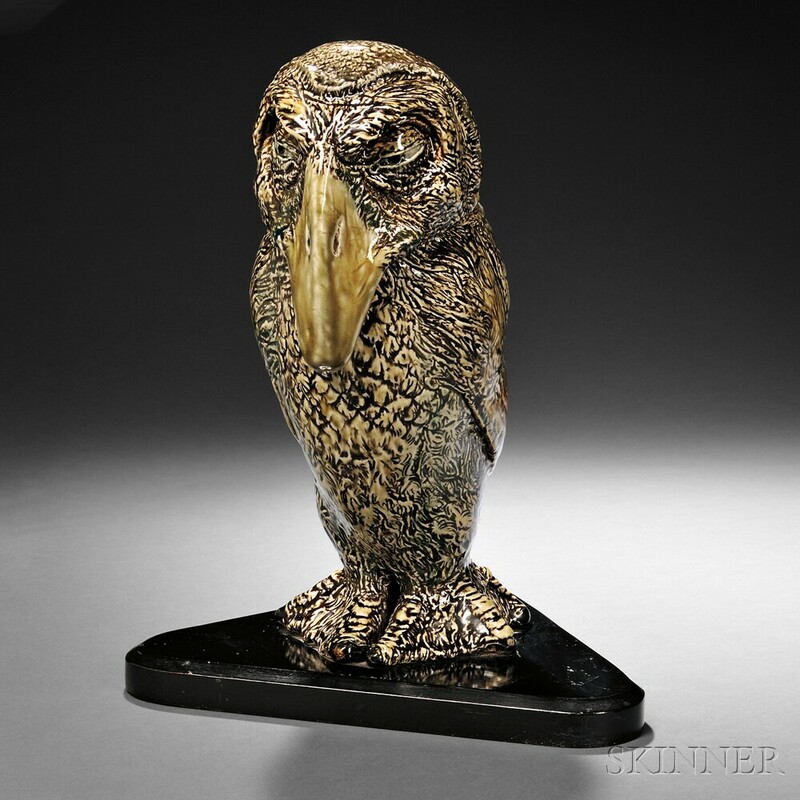 Recently collectors have pushed prices at auction to stunning levels. A specialty sale in 1978 of the collection of Richard Dennis, a London dealer, sent prices spiraling into four figures. The highest price at auction for Martin brothers' wares was registered last December with the sale of a droll-looking bird for $13,737. 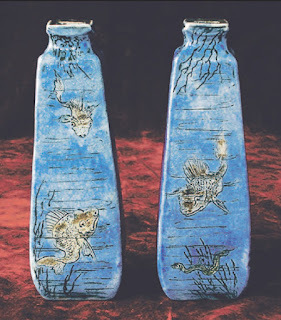 Todd Volpe, co-owner of the Jordan Volpe gallery and a collector of Martin brothers' wares for the last three years, has assembled a remarkable selection from eight collectors for this show. 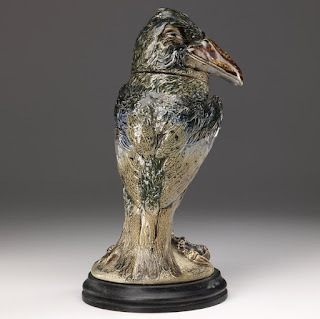 Half of what is on view is available for purchase at from $500 for a small saucy-looking bird to $20,000 for a blue-and-off-white sullen bird which was fired on Halloween in 1896. Mr. Volpe said that this may be the last major exhibition of the Martin brothers' grotesques because they are disappearing into museums. For this reason he did the most elaborate exhibition in the gallery's five-year history, a memorable, highly imaginative show designed by Gregory Gusse. And he had a arresting catalogue produced with superb photographs and an intelligent text by Isabelle Anscombe. It is $45.The catalogue is not the only book available on these wares. 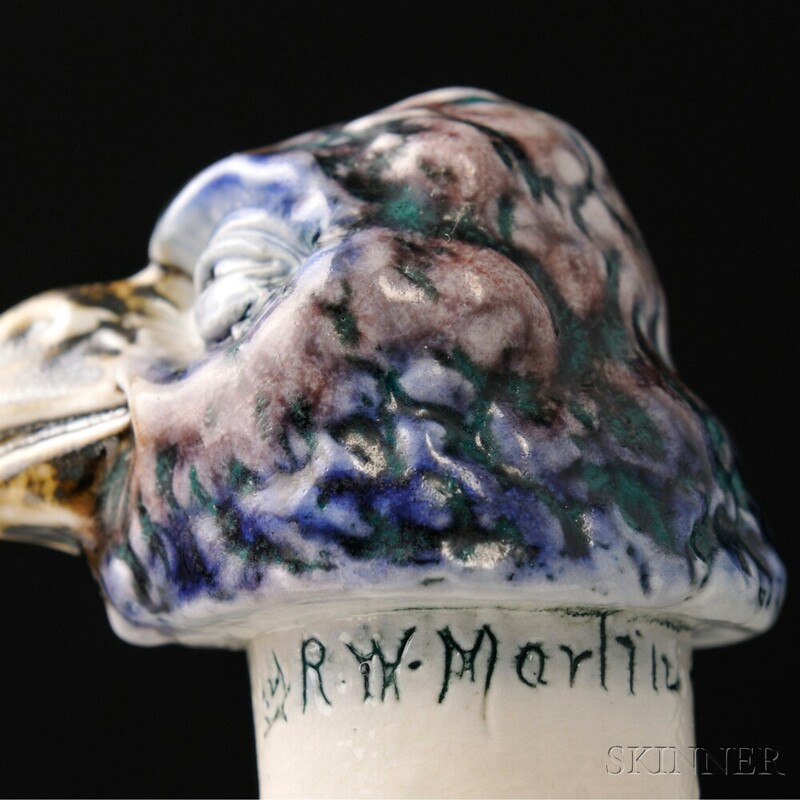 Mr. Dennis is co-author with Martin Haslam of ''The Martin Brothers Potters'' which Mr. Dennis published. 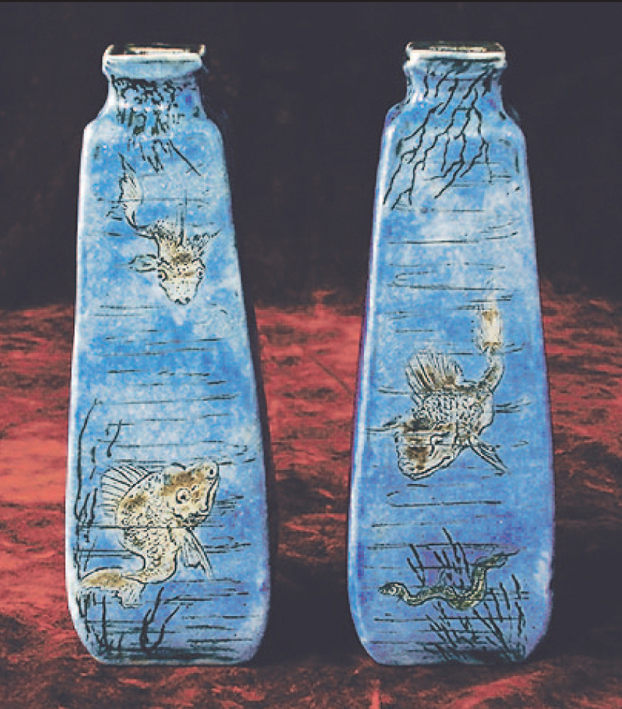 This generously illustrated and scholarly account is available at the SoHo gallery for $60. Jardiniere decorated with Passion Flowers by the Martin Brothers. c. 1890. Salt-glazed stoneware, 6 x 8 inches (15.2 x 20.3 cm). Collection: AD Antiques Ltd.
From Collectors Weekly: Martin Brothers London & Southall 12" Pottery Bird w/ Removable Head. Robert Wallace Martin 1843- 1923 was the pioneer and the dominant force behind his brothers, perhaps because he was the eldest. 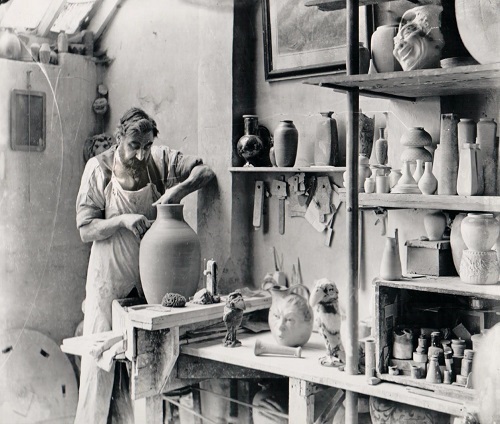 He was the sculptor and modeller. 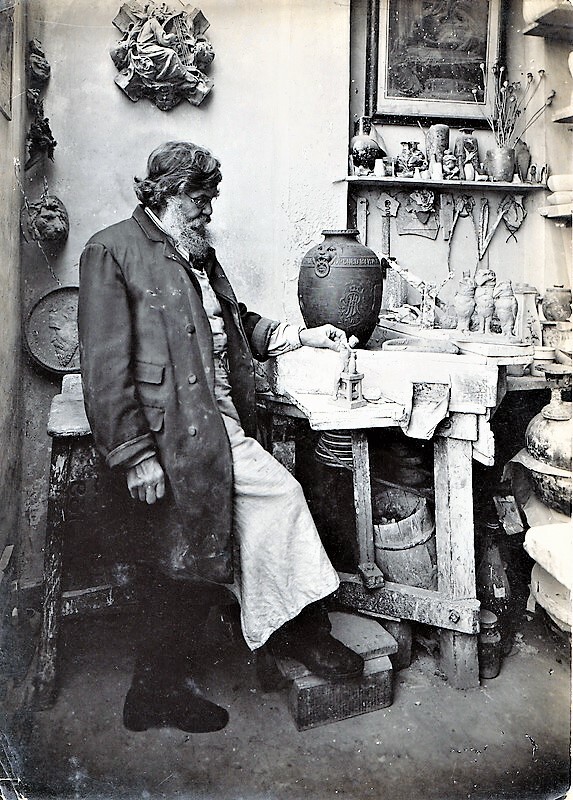 He began making artistic terra cotta and salt glazed pottery at Pomona House in Fulham in 1872, and the work was fired at Old Fulham Pottery. Aged 20 he had modeled his own portrait in bas relief and was his own subject for a similar work two decades later. He won many prizes for his carvings; the first gained when he was sixteen. He won the first prize at the South London Working Classes Industrial Competition. He trained both as a sculptor’s assistant and as a stone mason in the yards near the Houses of Parliament. He grew up reading Samuel Smiles, Dickens and Ruskin and so would have known about the debate between those who favored conventional ornamentation and those who preferred irregularity and individuality. 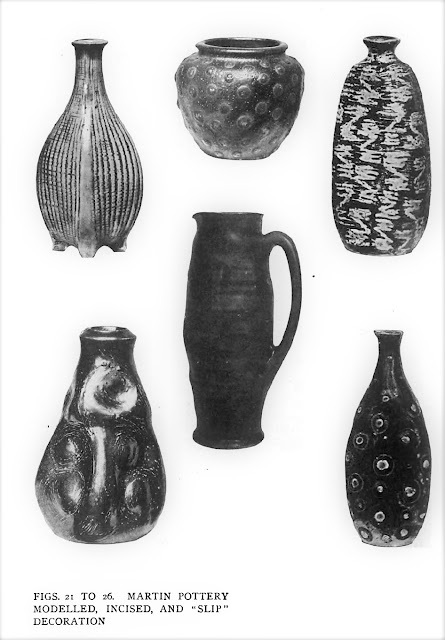 He thus modeled his vases and ornaments as grotesques. He married Elizabeth Martin, 1845-1924. They had two daughters, Amy Mary Margaret, 1877-1952 and Beatrice Mabel, 1880-1882. They had one son, Clement Robert Thomas, 1882-1962, who followed his father in the same profession. Beatrice Mabel married Philip Moore in 1921. Edwin Bruce Martin lived with his brothers and parents in Brixton until at least 1881. 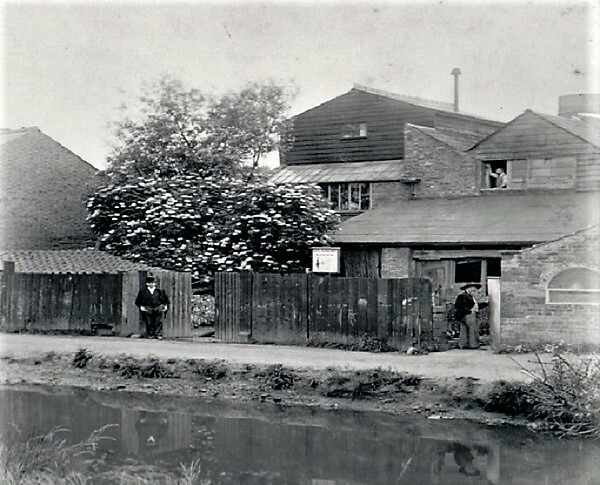 Later he was at Cedar Creek, Mill Platt Avenue, Isleworth, in 1908 and then at 39 Church Road, Southall from at least 1911. 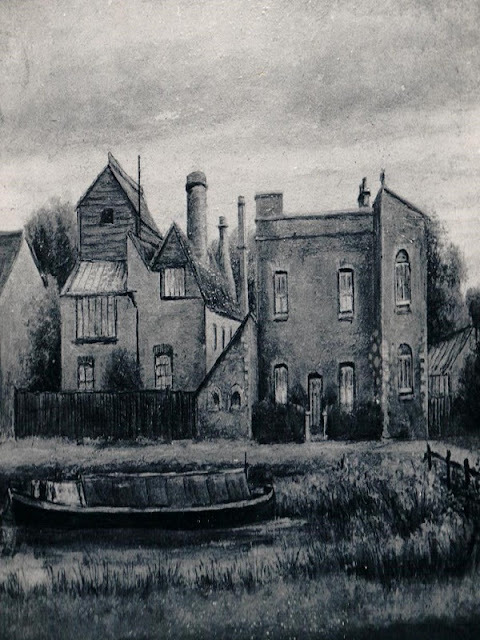 He married, at St. John’s church, Isleworth, in 1908, Katherine Winterbourne, 1874-1943. They had three daughters, Olive Margaret Matilda, Alice Beatrice and Margery Winifred. 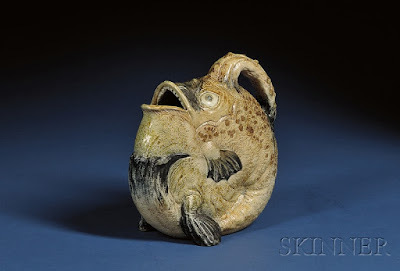 His role was the etcher and painter of the firm, designing the quaint bird and fish figurines, signing them as the work of the firm, Martin Brothers of Southall and London. 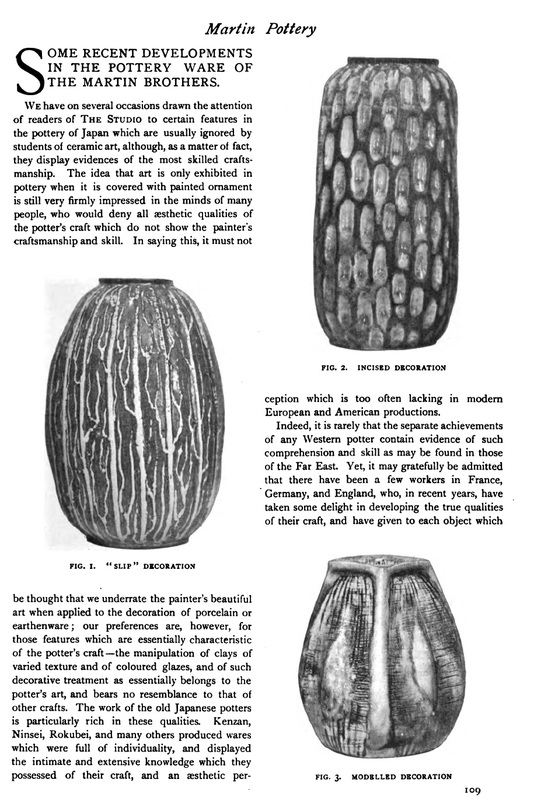 He also prepared many of the clays and threw many of the smaller pieces. He died on 2 April 1915 and his will left £479 19s. He had been suffering from cancer of the mouth for three years, but despite radium treatment, he died at West London Hospital after another operation. 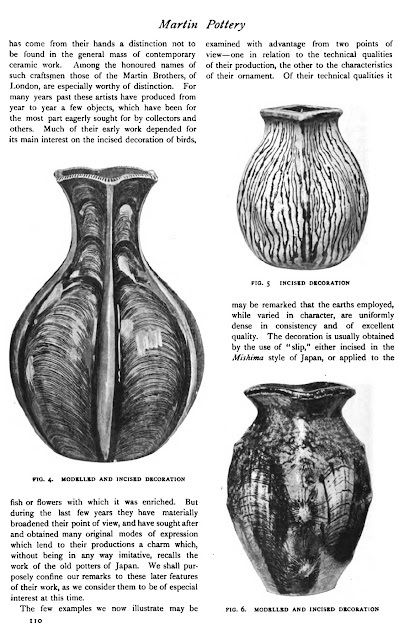 The pottery was continued by Robert Wallace’s son, Clement, after his father’s death. He had already been employed in the business for over a decade and appears to have continued to do so until 1935. Charles Douglas Martin 1846-1910 began his working life as an office boy. He started working with Robert as a potter, but continued to live with his parents and after his father’s death, with his widowed mother, until presumably, her death. He was the salesman and kept a shop in Brownlow Street, Holborn, to sell the goods until 1908. Greenslade wrote, "After they have left their creators hands at Southall, they are entrusted to the kindly care of Mr Charles D. Martin, the brother who has for so many years superintended the dispersal of them to their “world-wide”patrons, and none has taken a keener interest in or more loved the work. 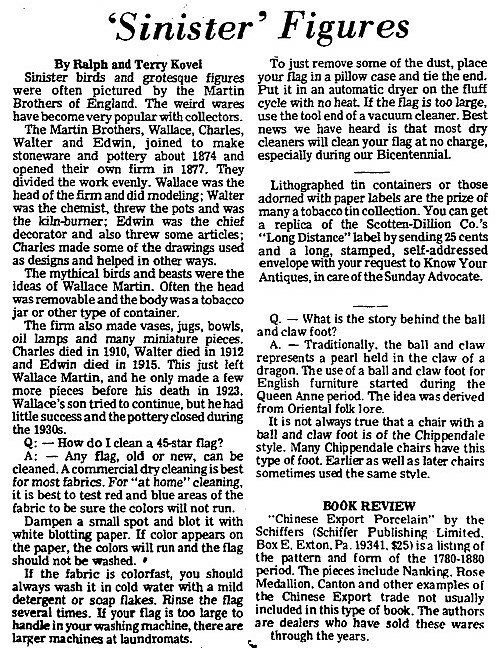 After they have left their creators’ hands at Southall, they are entrusted Happy the connoisseur who should be wandering in the precincts of Holborn, and can find time to drop in and have a look around, for he will easily discover many pots with charms and subtle characteristics which will at once fascinate him, and whether the cost be one shilling or five pounds his fancy can easily be satisfied. However, the shop was not appealing in appearance; being described as ‘dingy and ill lighted, dusty, obscure’ and ‘forbidding’. The shelves were crammed with stock without any pretence of a more attractive display. It had the atmosphere of ‘an old curiosity shop’. 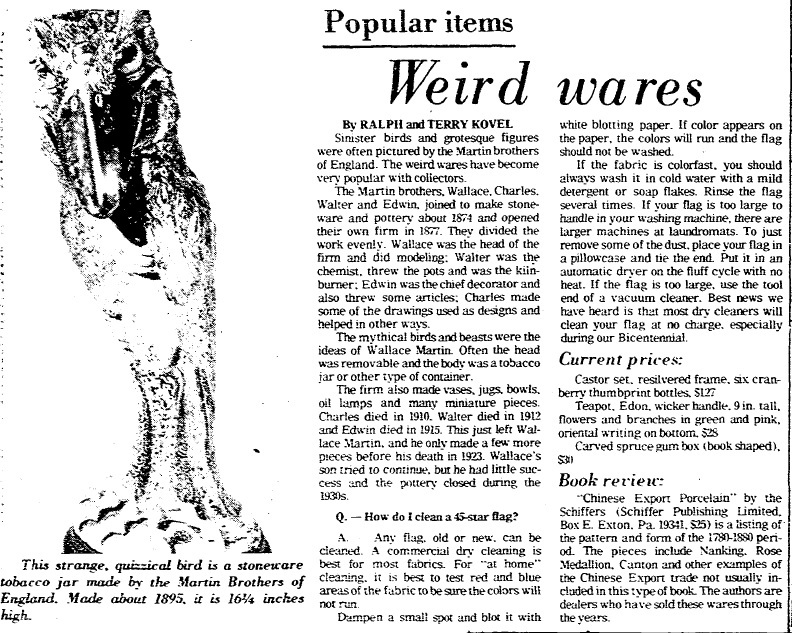 Charles often did not like selling his favourite pieces and so kept these hidden from the gaze of potential buyers. Unfortunately his health was poor. 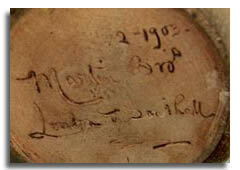 On 3 March 1910 he was admitted into Wandsworth Asylum and later into the Middlesex County Asylum. He died on 10 June 1910 and was buried in Norwood Cemetery, although he never lived in Southall, presumably because he had the shop to run and elderly parents to care for. Walter Frazer Martin 1859-1912 lived at various addresses in Southall; 2 Melrose Villas in 1891; 25 Endsleigh Road by 1906 and at 18 Rectory Road in 1911. At Fulham Baptist church in 1906 he married Elizabeth Pattinson, 1873 - and they had at least two children; John Robert Fraser, 1907-2000 and Norah, 1910 - He died at Witley Gardens in Southall on 8 March 1912 and his will left £724 12s. 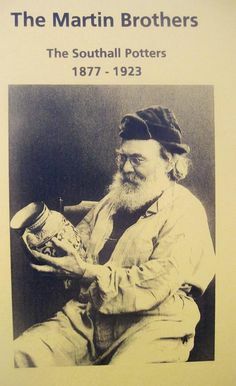 He was the brother who mixed the arts of potter and chemist. He mixed the West of England clays, which they used for their pots, and then stood at the wheel. 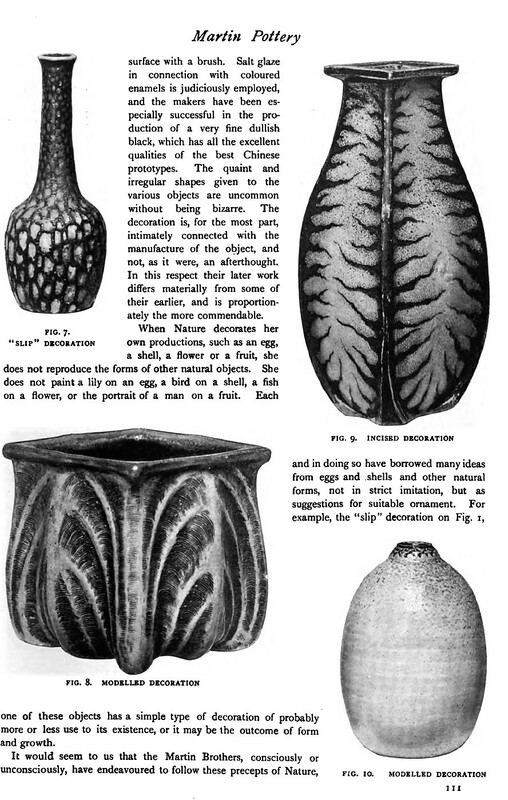 He also was responsible for the colouring of the pots, and that was his work alone. For his ‘throwing’ he had gained a prize from the Turners’ Company. Yet when he died, his surviving two brothers did not know his colouring secrets, and they wondered if it had been left in a coded message among his papers. His secrets died with him, however. 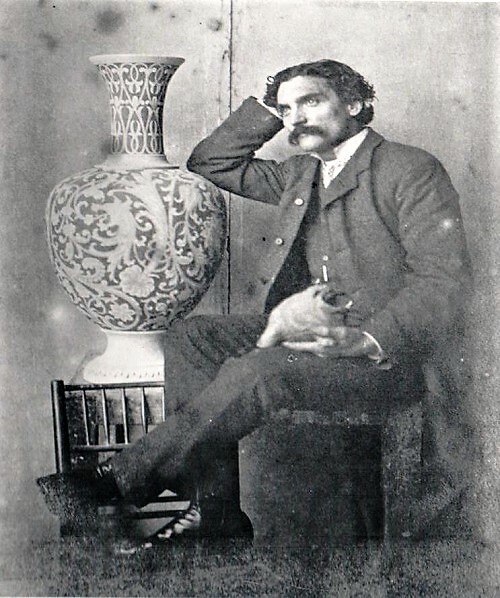 Ernest Marsh, a great collector of Martinware, wrote a letter of condolence to state: A great artist has finished his work, and his death is a great loss, nationally were the fact but realized. Those of us who had the great privilege of meeting him in association with his work know something of this, and most sincerely deplore that which is now destined to be accomplished by him, especially when it seemed that so many of his ripest years of work were still come and just to hand’.